Ahhh…marshmallow and caramel…2 of my favorite foods! Add some chocolate for good measure and shazaam! Delicious! I hope you enjoy these full flavored and textured cookies as much as I do! Roll into 1 inch balls. Place on greased cookie sheets and into the oven for 6-8 minutes. Unwrap roughly 20-25 caramels and put in saucepan with 2 tbs canned milk. Let caramel melt over med-low heat and stir often. Spoon a heaping teaspoon full of melted caramel onto each cookie. 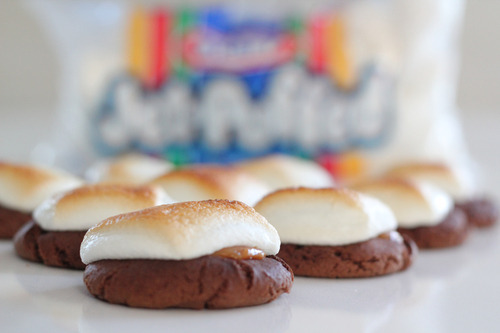 Turn oven broiler on high and place 1 large mallow on top of each caramel covered cookie. Put back into the oven, under broiler for 1-3 minutes until mallow tops are golden but still puffy. (not flat and melted) Remove from cookie sheets to cool on wire racks.